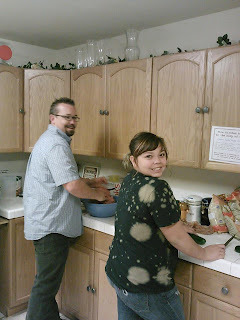 As we've done in the past, yesterday we shared a taste of Bulgarian cuisine with our church family at Calvary Bullhead. We grilled up some kebapchete, a blend of ground pork and beef seasoned with chopped garlic, cumin, salt, and pepper. We also shared some shopska, a refreshing salad of chopped up cucumbers, tomatoes, and onions with oil and vinegar and topped with crumbled sirene cheese (a feta unique to Bulgaria). Finally, we added our favorite appetizer, french fries topped with more sirene cheese. Joey handled the grilling, while Vernon, Roy, Linzi, and I loaded up the food on plates and Megan handed them out. 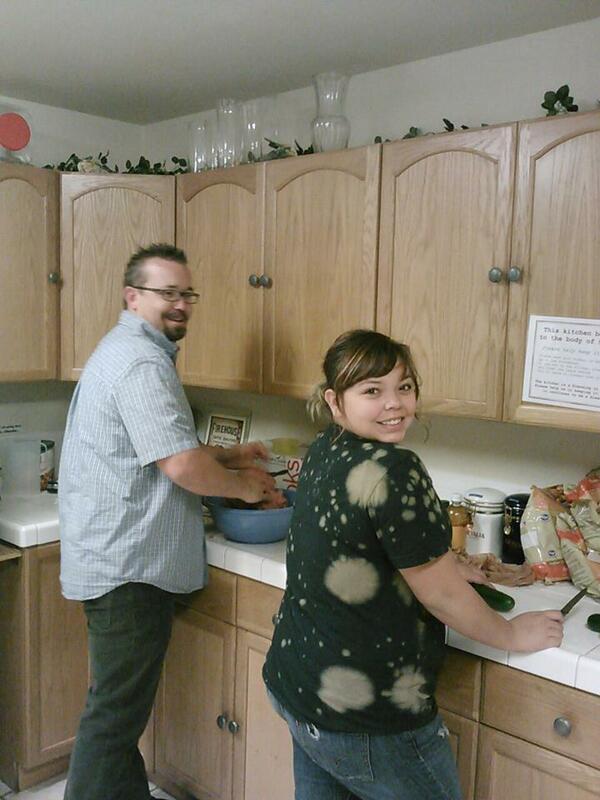 Special thanks to my lovely bride, Melissa, for taking donations and calling the orders into the kitchen! After serving up the food, we each made a plate for ourselves and sat together to go over plans for our upcoming trip. We've got a lot of preparation ahead of us, so we'll be meeting pretty regularly from now until we leave. A good chunk of our time in BG will be spent at the Black Sea children's camp. However, we really can't start planning our ministry there until the Blaga Vest church in Sofia finalizes the details of the week (theme, lesson topics, etc.). However, we are really striving to maximize our time this year and are planning a number of other ministry opportunities while we are in Sofia before and after the camp. Its quite a challenge to make plans each year for ministry that will take place on the other side of the planet. We're never quite sure what supplies and resources will be available there or what we'll need to bring with us in our limited luggage space. We have to coordinate with multiple people from different churches, and their day/night cycle is the opposite of ours. This, along with the language barrier, makes for interesting communication issues. Also, the culture in Bulgaria is radically different from our own and we need to take that into account in every aspect of our planned ministry and activity. Things just don't work the same or get taken the same way over there. Having said all that, our greatest need right now is prayer. We are prayerfully considering what every aspect of our service will look like and how God wants to use us so that we can effectively prepare. We don't just want to do ministry... we want to minister and serve the Church and people of Bulgaria on the Lord's behalf and through His power. We have a number of really great ideas that we'd like to take with us, but we need to determine what God wants us to do... not just what we want to do. We don't want to get stuck doing things because we've always done them, or not doing things because we've never done them. We just want to do something for God that will bless the our Church family there and minister to those in Bulgaria who still don't know the hope of Christ (most of the country)! The makeup of the team is still in flux, but it looks like were taking a smaller group this year. We hope that will allow us to be more flexible as the Spirit leads, and more focused on the work before us. Prayer for several teenage girls who really want to go but need to come up with the money to make the trip. As I write this, there are only 120 days until our departure and I know from past experience how quickly that time will fly by. God bless!